Makeup is one of my favorite things ever. As for foundation, I always have trouble finding one that I like, let alone love. Foundations always seem to break me out, dry out my skin, cause me to have excessively oily skin or aren't my shade. After trying this foundation for about two and a half weeks, I feel as though I can give you my honest opinion. After wearing the Luxe Liquid Foundation consistently for the past few weeks I can honestly tell you that I absolutely love it. Formulation // This is a very very very runny foundation, which I tend to think makes it very hydrating. I feel like foundations that are on the more runny side give you hydration and a dewy finish, which this one totally does. Harness the light-refracting power of diamonds to bend light for a smooth, ageless complexion. Application // I have it in two shades; Brûlée and Naturalle and I use half a pump of each, mix them and dot it on my face. I then use the Luxe Foundation Brush (a flat top kabuki brush) and buff it in evenly throughout my face. When I received the foundation brush I was a bit hesitant to use it because I am more of a sponge applicator kind of gal. I have always heard great things about using a flat top kabuki brush to apply foundation but I never really purchased one. I am so glad I used this Luxe Foundation brush because I am literally obsessed. I have never used a foundation brush that applies my foundation so seamlessly and with a flawless finish! The brush is made with synthetic hair to help give a full-coverage and smooth application. I have already washed the brush and none of the hairs have fallen out. I guess only time will tell but for now my first impression is that they are very well-made. Finish // Like I said before, this is a dewy-finish foundation but if set with the right power, you don't have to worry about getting oily. I haven't had a problem yet and I have normal/combo skin. Wear // This foundation is very long-wearing on my skin. After about 6-7 hours of wear I have to blot my skin and add powder which is normal with foundations that I use. I even fell asleep with this foundation on and I didn't even break out, which is very rare with my makeup-filled nights. Can we take a moment and talk about how pretty and sleek the packaging is? I love that the foundation is packaged in glass and has a pump, not only is it easy for application, it is also very sanitary! Final Thoughts // I am very happy with all of the products Glo Minerals kindly sent me. I cannot wait to try out more of their products in the future, I already have my eye on their shadows and blushes! I have linked all of the products I talked about today down below. Feel free to check out their website and products, you won't regret it! I also have a promo code that you can use on your next purchase. Happy shopping!!! Use the promo code LOVEJOMY15 to get 15% off your entire purchase on the gloProfessional website! Bronzer // the Sunkiss bronzer is a duo. It has a matte brown shade along with a gold shimmery highlight. It definitely gives you that summer bronzed glow all year round. Lipstick // The sheer lipstick in Bali is definitely a wearable red that you can wear on a day-to-day basis. It's very hydrating and glossy, so if you're into high gloss, this baby is for you! I personally prefer a matte or satin finish but I don't mind this beautiful shiny red finish. 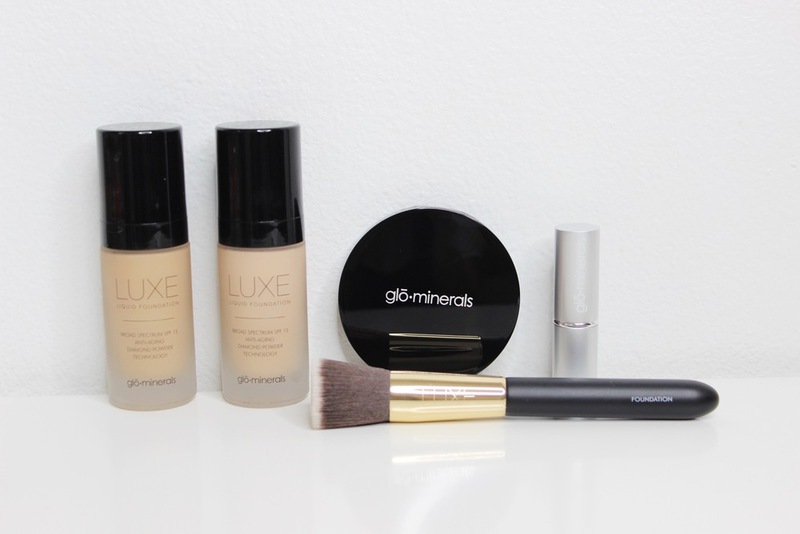 "glō∙minerals offers a mineral makeup system uniquely designed for skincare professionals and their clients. Our award-winning formulations deliver unsurpassed coverage, UV and environmental protection and an exceptional spectrum of mineral pigments. Talc free and non-comedogenic, glō∙minerals provides the ideal choice for even the most sensitive skin. Clinically advanced mineral makeup that covers, corrects and protects. • Formulated with anti-inflammatory ingredients"
Hope you all enjoyed this foundation review!